"Although optimistic, [State of the World 2014] is framed by a sentiment of crisis, with humanity at an unprecedented crossroads requiring a sharp departure from politics and business as usual... examin[ing] both obstacles to, and opportunities for, responsible political and economic governance." "This year's report, published by Worldwatch Institute, marks the organization's 40th anniversary. 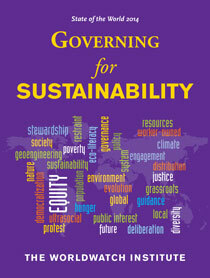 The study looks at what governing for sustainability really means. Authors highlight the responsibility of political and economic actors to achieve sustainability measures. They also noted that to be effective, governance systems must be inclusive and participatory, allowing members to have a voice in the decision making process." "For thirty years, the State of the World report has helped to map the gathering and then accelerating storm of environmental, climate, and resource crises. Identifying itself firmly with the collective interest of humanity as a whole living in harmony with nature, the annual report has sought to balance authoritative reporting of the increasingly bleak health of the environment with sustainable pathways out of the accumulating crises. In a world of competing sources of authority and power, the pursuit of atomized individual and national self-interests will court planetary disaster. This year's State of the World report has its focus on governance: how, in a world without world government, we can and must make enforceable rules for using finite resources democratically, equitably and, above all, sustainably, with fallible governments and imperfect markets working together for the common good." "State of the World 2014 can be read as a 'State of the Wealth' report. Never before has wealth commanded so much power or been so concentrated—even to the point of threatening civilized life. Wealth becomes unable to offer, not just a better future, but any future. Therein lies its weakness and the hope that the major governance shift that sustainability requires can be brought about." "The scientists have told us what we need to know about climate change. Now, as this fascinating volume makes clear, it's time for the political scientists to step up—and more importantly all of us in our role as citizens, making sure that we replace our ruinous energy oligarchy with a vibrant, sustainable and just democracy." "This book is a manifesto of practical hope published in the shadow of accelerating environmental catastrophe. It tells us that we do not have to sit on our hands and close our eyes as we wait for the deluge. Instead, we can govern and lead with some courage in the interests of all humanity." "In my four decades in government and public life, I have seen first-hand most of the flaws in national and international governance that this trenchant book critiques. Its suggestions for improving the ways we manage our relations with each other and with our planetary home are provocative yet clear-headed, and—if only we implemented them—would likely to put us on the path to true sustainability." "Achieving sustainable ways of living is inextricably linked to how we organize work in the future. State of the World 2014 makes an important contribution by illustrating how trade unions, far from being outdated, will be at the forefront of a just transition. It is a challenging compilation—coming at exactly the right time." "This volume offers a variety of informed and often passionate voices on the interface of environmental degradation and risk with conceptions and models of governance that, if we can summon the will, would promote sustainable management of the global commons. A clear, lively, thought-provoking book which serves well as a reasoned call to action."